Here is the first survey of the surviving evidence for the growth, development, and influence of the Neoplatonist allegorical reading of the Iliad and Odyssey. 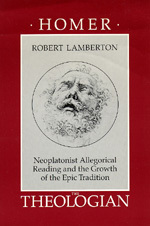 Professor Lamberton argues that this tradition of reading was to create new demands on subsequent epic and thereby alter permanently the nature of European epic. The Neoplatonist reading was to be decisive in the birth of allegorical epic in late antiquity and forms the background for the next major extension of the epic tradition found in Dante. Robert Lamberton is Assistant Professor of Classics at Princeton University.